MOSCOW, Russia -- Thousands of troops marched across Moscow's Red Square on Saturday and tanks rumbled through streets to mark the 70th anniversary of victory over Nazi Germany, an event boycotted by Western leaders over Russia's role in the Ukraine crisis. 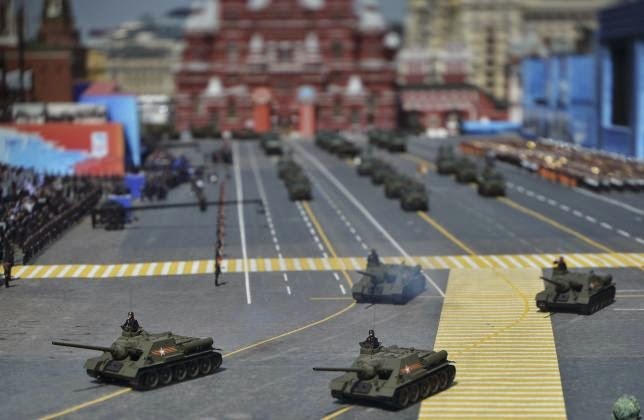 Soviet SU-100 tank destroyers drive during the Victory Day parade at Red Square in Moscow, Russia, May 9, 2015. Russia's Vladimir Putin has used the anniversary to whip up patriotism and fuel anti-Western sentiment, and at a parade in Kiev President Petro Poroshenko said Moscow was trying to hog the credit for the World War Two victory at Ukraine's expense. Though Western leaders stayed away, Putin was joined under the Kremlin's walls by about 30 foreign leaders, including Chinese President Xi Jinping, sitting on his right-hand side. In a sign of closer ties between the two, a column of Chinese troops took part. United Nations Secretary General Ban Ki-moon was also among those watching. Dignitaries from India, former Soviet republics and communist-era allies such as Cuba, also attended, underlining Russia's role as an outcast in Europe. German Chancellor Angela Merkel skipped the parade, as did U.S. President Barack Obama and the French and British leaders, but will attend a wreath-laying ceremony in Moscow on Sunday. On show was the Armata T-14, Russia's first new tank to be deployed for 40 years, and soldiers, some in World War Two uniforms, filed past under blue skies and bright sunshine. War veterans watched from the grandstand, their chests bristling with medals, while crowds of people choked sidestreets around the Kremlin, cheering and shouting as fighter jets roared over Moscow's city center. "Victory day is the most important holiday for Russia. In practically every Russian family, someone has died fighting for this country," said 43-year-old former marine Alexander Smolkin. "My own grandfather died defending Russia, this is our day to remember them," he said, adjusting his light-blue beret, medals and military fatigues. Putin has warned that fascism could be on the rise again and is suggesting other countries are rewriting history to play down Moscow's role in winning the war. "The basic principles of international cooperation have been ignored more often in the last decades. The principles which were hard won by humankind following the global hardships of the war," he told rows of soldiers standing to attention. "We've seen attempts to create a unipolar world," he said, echoing a 2007 speech when he lambasted the West's world view. Putin later lead a rally, known as the Immortal Regiment march, with people holding pictures of relatives who fought during the war. Police said more than 250,000 people joined the rally through Red Square in one of the largest turnouts in the country's recent history. The Russian president held a picture of his father. "I'm very happy that my father is with me now, I'm holding his portrait in my hands," he said in a televised broadcast. Many Russians saw the West's boycotting of the parade as disrespect. An estimated 27 million Soviet citizens were killed in the 1941-45 war. Ukraine says it lost between 8-10 million of its citizens, including 3.5 million in the Soviet forces. Poroshenko rebuked Moscow for accusing Kiev of using "fascist" methods to oust Moscow-backed President Viktor Yanukovich in February last year which triggered the confrontation and sparked Russia's annexation of Crimea and a pro-Russian separatist rebellion in eastern Ukraine. A minority of Ukrainian fighters in World War Two joined a militia that was prepared to ally itself with the Nazi invaders to fight Soviet Communist rule, leaving Ukrainian nationalism vulnerable since to accusations of fascist sympathies. "It is the utmost cynicism to depict our country as a supposedly fascist state. It is done with the aim of justifying to the Russian people its own criminal action - Russia's aggression against Ukraine," Poroshenko said. In a further sign of distancing itself from its former Soviet master, Ukraine joined most of Europe in a separate ceremony on Friday, a day before Russia. "We will never again mark this day with the Russian scenario which cold-bloodedly uses our victory day as an apology for its expansionist policies and for keeping its neighbors in its orbit and recreating empire." More than 6,200 people have been killed in fighting between pro-Russian separatists and government forces in eastern Ukraine which Kiev says has been stoked by Russia. Moscow, which annexed the Crimea peninsula from Ukraine last year, accuses the West of orchestrating the events that led to the Ukrainian uprising. Though a ceasefire is still tenuously holding, the Ukrainian military said on Saturday that separatists, backed by Russia, were keeping up attacks with artillery and mortar bombing on government forces in the east and south-east of Ukraine. It said four Ukrainian servicemen had been wounded in attacks in the past 24 hours.